After a lacklustre 2011, Chaosium, Inc. surprised everyone by publishing not one, but two titles in 2012 for its flagship RPG, Call of Cthulhu. The first was the much lauded Cthulhu by Gaslight, marking the welcome return of the Mythos to the Victorian Era of the 1890s. The second was the surprise. 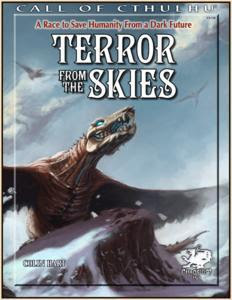 Terror from the Skies: A Race to Save Humanity from a Dark Future presented an all new campaign for Call of Cthulhu, the first from Chaosium since Tatters of the King, published in 2006. Like that highly regarded campaign, Terror from the Skies takes place during the RPG’s classic period of the 1920s and is primarily set in England, although events will take the investigators much further afield. Like its forebears, Terror from the Skies is a world-spanning campaign, albeit one that is on a much smaller scale. It begins small, with a single scenario set in the South East of England where the investigators are to attend a wedding. If the villagers are to believed, the wedding and subsequent marriage will not be a happy one; but is this mere superstition or do the lack of weddings held at the local church lend credence to their claims? This is an engaging little affair with an array of detailed NPCs that is designed primarily to introduce the investigators to the NPC who will get them involved in the main part of the campaign. From Kent, the campaign moves onto the North-East where most of it is set. Lured by a letter from the NPC and by reports of vampire attacks in the Yorkshire town of Whitby, the player characters are asked to aid a friend who has been investigating certain mysteries of an outré nature. This being Whitby, the first thoughts upon the players’ minds should be Bram Stoker’s most famous creation, but thankfully the author avoids such clichés, the threat being more in keeping with the game. That said, there are some notable parallels between Dracula and the campaign’s true villains, which will slowly become apparent as the investigation takes the player characters first across the North Yorkshire Moors and then further north to the cities of Durham and Newcastle. Eventually enough will be hinted at to suggest to the investigators that various persons are co-operating with an intelligence to engineer a very dark threat. For its antagonists Terror from the Skies chooses a foe ill-used outside of Delta Green – the insect-like, interstellar refugees known as the Shan. For the most part they are well used, their plot being woven around a very tight schedule in the summer of 1929. A major aspect of their role as protagonists is that once they become aware of the investigators’ interest in their plan, the Shan will come after them, not only looking into their activities, but at times, also moving directly against them. This is one of the campaign’s strengths, along with both the aforementioned tight schedule which will force the investigators to keep moving and the concept behind the campaign itself. Although initially the campaign has a Purist feel, as it progresses, Terror From The Skies takes on an increasingly Pulpy feel. This is particularly evident where combat is involved, a subject that the author does not address directly, despite the fact that it being set mostly in England will influence the role and effect of combat in the campaign. In other words, the laws regarding combat and firearms in the United Kingdom are different, as is the selection of available weaponry, but none of this is addressed. All it would have required is a side box addressing the issue. It is also evident in certain sequences that possess not the structure of an investigative scenario, but a big puzzle box, one that is almost Dungeons & Dragons-like. Some of these sequences also suffer from a bloat of dice rolling at odds with the simplicity of the Call of Cthulhu mechanics. If much of this sounds good in concept, then it is. There is the makings of a pulp action campaign in Terror from the Skies. The villains and their plans are interesting, and they are for the most part, reasonably well handled. Unfortunately, the execution does not so much leave much to be desired, as it does leave everything to be desired. The first hint at this comes when the campaign’s introduction wanders randomly into its prequel scenario. The second comes in the opaque nature of the link between this prequel and the bulk of the campaign. The third comes in elements and parts of the campaign being mentioned in one chapter without any accompanying explanation, the Keeper being at a loss until he finds said explanation, an NPC’s name, and so on, in the next chapter. All too quickly, reading Terror from the Skies becomes an exercise in frustration as not enough is explained in the text when it should be and this just gives it a discordant feel. Cartographically, Terror from the Skies also presents the Keeper with nothing but consternation. Not by the quality of the maps included in the book, but by the absence of maps. In the course of the campaign, the investigators visit at least eight towns and villages, not in passing, but in the course of active investigation. There is not a single map of any one of these places in the book. The text does describe the routes that the investigators will take from one place to the next within these locations, which is essentially providing a narrative for Keeper and players alike, but a narrative without a reference. Without that reference it is almost as if the author is directing Keeper and players alike rather than allowing either the agency to run or play campaign as they see fit and move around within the campaign. Worse still, the investigators are required to visit numerous locations and undertake various actions at each. For example, the act of burglary is a frequently discussed option that the investigators can undertake, but again, not a single map has been provided of these locations where it is suggested as an option. Worse, the culmination of the campaign takes place on an airship, but no plans are provided of the airship in question. In the case of this airship, the events aboard which the author devotes the best part of two chapters to, there is not even a description of its deck plans. Or its crew – let alone their game stats. It has to be asked, but why is this campaign missing so many of its important maps? As mentioned, the campaign does not provide game stats for the crew of the airship. Sadly this is only an omission amongst many, for once past the introductory scenario, not one of the campaign’s many minor NPCs – NPCs that the investigators are expected to interact with, even fight – is given their set of game stats. There is a set of minimal stats for some cultists, plus advice to reuse them, but this not only leaves more effort on the part of the Keeper to undertake, it also depersonalises the NPCs. Many of the NPCs who are given stats and write-ups are overdone, sometimes ludicrously so when it comes to the Cthulhu Mythos. The campaign does come with plenty of hand outs. With many of them, an effort has been made to make them look authentic and there is some artistry on show here. Unfortunately the newspaper articles will never look like newspaper articles because they are printed over a newspaper background rather than as newspaper articles, and the hand outs that attempt to look handwritten still look as they have been done onscreen because of the cursive typefaces employed. In addition, some of the hand outs are too dark to read clearly and many of the later hand outs amount to little more than printouts. As to the suggestion that some of them might have been written in an alien script, this falls flat unless there is some new mystery to Times New Roman. Besides the missing maps and NPC stats, Terror from the Skies is also all too often missing the small details that matter – the details that add verisimilitude and the details that support elements within the campaign. For example, the investigators at one location might find a newspaper belonging to an NPC that he brought with him from his home country, but this newspaper is not named. It would be a simple matter to give the name of a newspaper and so add to the reality of the game. Similarly, the investigators are visiting another country and are presented with gifts – what are these gifts? In either instance the players will ask what their characters have found or been given. Not having this information ready for the Keeper the campaign dismisses the investigators’ actions. In terms of layout, Terror from the Skies looks to be clean and tidy. Yet that is only upon a cursory glance, as it quickly apparent that physically there is no finesse to the book or its layout. This is only exacerbated by the editing, which completely fails to address any of the issues with the campaign – where the various elements of a chapter should go, where the explanations should go, the Call of Cthulhu format, inserting lists of the campaign’s clues and the parts of the plot that they link to, the small details that that enhance the campaign, and so on. All of which is in addition to spelling and format errors that litter the book. The truth is that Terror from the Skies was never going to be a great campaign. It could have been, however, a solid campaign, one that was ready to play with relatively little preparation. It is even possible to imagine this as a starter campaign, though of course, it is set rather late in Call of Cthulhu’s Classic period of the 1920s for that. The accompanying truth is that Terror from the Skies was never going to be that solid a campaign. Not with these editors. Not with this layout artist. Not with Chaosium. The terrible truth to Terror from the Skies is twofold. Terror from the Skies feels like an unfinished book and Terror from the Skies feels like a publisher’s first book. In this, Terror from the Skies is also a frustrating book. Frustrating because it leaves so much for the Keeper to do in preparing the campaign for play. Frustrating because in the hands of competent editors and developers, so many of its issues could have been addressed, if not to make it perfect, but to make it much, much better. Thanks for another great honest review. Some really good points here. A shame because it sounds, on the face of it, like a great campaign. I picked up Terror from the Skies when it first came out, and could not agree more with your review. This book is an unfortunate mess. Still, we're going to make a go of it - we'll be starting playing it this coming weekend. We'll see how it goes, I suppose. And yes, it will require quite a bit of additional fill to round out into something reasonable.